This article provides an insight towards diagnosing and managing thalassemias. It begins by describing the structure of normal hemoglobin and elaborates on our understanding of the pathophysiology of thalassemia. An overview of transfusion therapy and its complications including endocrinopathies and cardiomyopathy has also been discussed. Introduction: Antidromic stimulation is usually used in the evaluation of lateral antebrachial cutaneous nerve (LABCN) and medial antebrachial cutaneous nerve (MABCN). This study was conducted to evaluate the relationship between orthodromic and antidromic stimulations of these nerves. Materials and Methods: Medial and lateral antebrachial conduction studies by antidromic and orthodromic stimulation. Results: Sensory nerve action potential (SNAP) amplitudes were larger with antidromic stimulation in the majority of subjects. 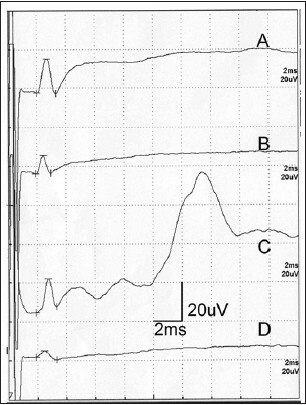 The lateral antebrachial SNAP amplitude was 20.5 ± 9.29 μV with antidromic stimulation and 14.6 ± 6.13 μV with orthodromic stimulation (P < 0.001). Medial antebrachial SNAP amplitudes were 12.8 ± 4.93 μV using antidromic stimulation and 6.5 ± 3.84 μV with orthodromic stimulation (P < 0.001). Sensory conduction velocities were faster with orthodromic lateral antebrachial stimulation (P = 0.002) whereas velocities were similar in medial antebrachial nerve. Supramaximal stimulation of MABCN was not possible in half of the nerves sampled to avoid the muscle artifact. Conclusion: Orthodromic stimulation of LABCN and MABCN are easy to perform and can be supplanted for antidromic stimulation in which Supramaximal stimulation may not be possible in some individuals. Aims and Objectives: The aim of this study was to compare operative times and frequency of complications between groups for total thyroidectomy without evidence of malignancy. Materials and Methods: This interventional (experimental) controlled trial was conducted at Lady Reading Hospital from 11 th June, 2010 to 10 th June, 2012 and included 120 patients. Group 1 included those patients that underwent total thyroidectomy using the Harmonic Focus R , whereas Group 2 included all those patients that underwent total thyroidectomy by a clamp-tie technique. The data following collection was entered onto the SPSS version 16.0 for Windows R and analyzed. Results: The demographic data in comparison by the two groups saw no significant difference (P = 0.822). Age ranges were also similar, but late age was not a common finding. The mean operative time was lower in the Group 1 (55.3 [±12.1] min) versus (71.6 [±18.2] min) for Group 2. The other significant differences observed in the mean hospital stay (P = 0.031) and mean blood in the drain at 24 h was 55.6 (±11.34) ml in Group 1 versus 83.7 (±21.4) ml for Group 2 (P = 0.001). The frequency of persistent hypocalcemia and hoarseness was observed in the conventional clamp-tie group. Conclusion: The use of ultrasonic dissector is safe and significantly reduces operative time. The frequency of hypoparathyroidism inferred from hypocalcemia persisting beyond 1 month was greater in the conventional clamp-tie group as was the amount of blood in the drain at 24 h.
Background and Purpose: The objectives of the study were (1) to compare two techniques of sealant placement using Acid-etch technique and by using an Air abrasive technique, (2) to determine whether particular tooth locations are related to sealant loss or retention. Methodology: 30 children in age group 7-12 years were received sealant on non carious, non filled, occlusal, and buccal pit surfaces of both permanent first mandibular molars (36, 46) two in each subject of treatment groups: 1) Acid etch technique (Group A) and 2) Air abrasion without acid etch (Group B). A total of one hundred and twenty surfaces received sealants, and were evaluated at six months. 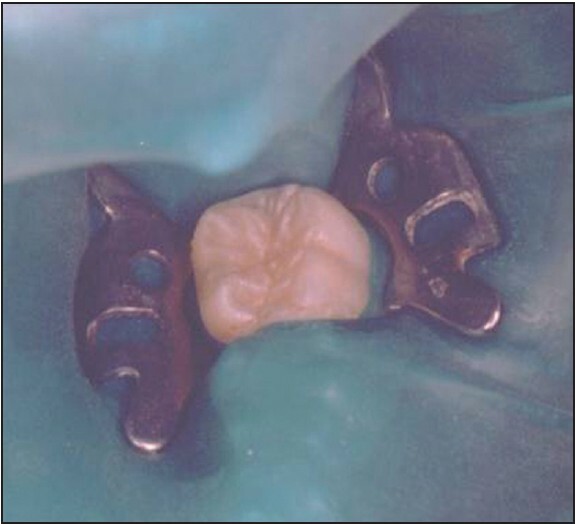 Results: Rate of complete sealant retention at six months for occlusal surfaces were 89.29% for Acid etching and 78.57% for Air abrasion , and for buccal surface were 50% for Acid etching and 32.14% for Air abrasion. Conclusion: This study suggested that, rates of complete retention on the occlusal and buccal surfaces of both treatment groups were not significant. More research is needed to identify factors contributing to low retention rates on occlusal and buccal surfaces for Air abrasion technique. Background: Adolescence is a period of transition between childhood and adulthood. Nutritional requirements during this period increase tremendously compared to preceding years of growth. The nutritional status of adolescent girls, the future mothers, contributes significantly to the nutritional status of the community. The present study was aimed to assess the current nutritional status of the adolescent girls. Materials and Methods: This one-year community-based, cross-sectional study was undertaken at a village Peeranwadi of District Belgaum, Karnataka among 400 adolescent girls of 10 to 19 years. Information on socio-demographic variables was collected by an interview using pre-designed and pre-tested questionnaire. A 24-hour recall method was used to assess nutrient intake. The nutrient intake was calculated using tables of nutritive value of Indian foods. For the comparison of anthropometric data, National Center for Health Statistics and National Health and Nutrition Examination Survey standards were used. Results: The mean age among the study population was 12.9 ± 2.06 years. Majorities (73.5%) of them were Hindus, 98.5% were literate, and 90% were currently studying. Adolescent girls between 10 and 14 years were more stunted (63.82%) as compared to 15 to 19 years (40.84%) (P = 0.0003) and thin (60.79% vs. 39.43%; P = 0.0009). Overall, the mean calorie intake was observed to be 1272.20 ± 133.28 kcal/day, protein intake was 40.99 ± 3.32 gm, and iron intake was 14.42 ± 2.58 mg. Conclusion: Overall, majority of girls were having dietary intake less than 50% of RDA, and almost three fourth of girls were anemic. Introduction: Percutaneous nephrolithotomy (PCNL) achieves excellent stone-free rates with acceptable complication rates and is therefore the treatment of choice for large renal calculi. It is generally believed that the establishment of a proper access tract is the crucial step. It is also well-known that PCNL is a difficult surgical technique with reported long learning curves. Apprenticeship is the traditional way of acquiring surgical skills. We report our experience in structured apprenticeship training in PCNL at our center. Materials and Methods: During the study period July 2007 to June 2012, the residents were introduced to a structured apprenticeship training program in PCNL. Results: During the study period, five residents underwent this structured apprenticeship learning. Stone clearance rate of 85.54 ± 2.67 was achieved by all the residents. The stone clearance rate for solitary renal pelvic calculi was 100%. Secondary procedures were required in 15.27 ± 2.74 of cases, blood transfusion rates were 15.2 ± 3.2, and the complication rate was 8.55 ± 1.6. Using the surgical surrogate of operation theatre time and fluoroscopy time, it was observed that competence in PCNL was obtained after 21 cases. Conclusions: Today in the absence of cheap and effective alternative training systems, structured apprenticeship training under the supervision of dedicated trainers is an effective way to train trainees. This helps in reducing the learning curve of the trainees. 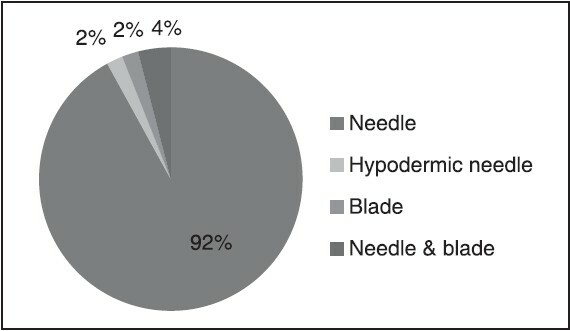 Background: Needle stick injuries (NSIs) caused by sharp instruments such as hypodermic needles, blood collection needles; intravenous (IV) cannula or needles used to connect parts of IV delivery system are common in clinical practice. A potential risk of transmission of various fatal diseases such as acquired immunodeficiency syndrome, hepatitis and others have been a matter of serious concern in busy clinical settings. Aim and Objectives: The present survey study was carried out to evaluate the prevalence of NSIs among nursing personnel of our institute so as to identify the potential risk factors responsible for possibly acquiring NSIs. The study also aims to reinforce uniformly the recommended preventive measures by the nursing personnel in our institute with the formulation and implementation of newer preventive strategies by hospital authorities. Materials and Methods: A cross-sectional survey was carried out from July 2012 to November 2012 in the nursing department of our hospital. Informed verbal consent was taken from nursing personnel prior to distribution of the self-reporting questionnaire. Questions related to awareness such as cause of NSIs, number of NSIs, procedures that caused NSIs, clinical response of personnel after injury, preventive measures like hepatitis B immunization, use of personal protective equipment (PPE) and reasons for not using the PPE and training regarding prevention of NSIs were also included. A total of 179 staff nurses from all clinical areas of the hospital participated in this study excluding those who were on any kind of long leave. Statistical analysis was performed by using the Statistical Package for the Social Sciences version 15 for windows and value of P < 0.05 was considered as significant and P < 0.001 as highly significant. Results: Almost more than half of the nursing personnel (57.5%) had NSIs at one occasion or the other. Nearly 58% nursing personnel had NSIs for 3-times and few had even more than 10 times. NSIs during bedside care of the patient (57.2%) were reported as one of the significant potentially vulnerable location to get the NSIs as compared with the operation theater and emergency (5%) areas (P < 0.001). About 92% of the nursing personnel reported that needles used in routine injection practices were the main instrument that caused NSIs as compared with the hypodermic needle and surgical blades. Recapping of needles (66%) was the main procedure that caused NSIs as compared to IV line (20.4%) and others (P < 0.001). Around 81% nurses were already vaccinated against hepatitis B before the survey study. Conclusion: NSIs are highly prevalent among nurses. Injection practices have to be improved with reinforcing and modification of existing preventive measures. Procedures associated with higher risks of NSIs such as recapping of needles, non-wearing of gloves, improper disposal of sharps and others should be strongly discouraged so as to decrease the incidence of NSIs and morbidity and mortality associated with it. Objective: To evaluate the usefulness of mucin stains in differentiating benign and malignant lesions of prostate. Materials and Methods: Sections were obtained from archival paraffin blocks which included randomly selected 70 cases of benign hyperplasia and 30 cases of carcinoma prostate. After confirming the diagnosis, sections were stained for Periodic Acid Schiff (PAS) to study neutral mucins, Alcian blue (2.5 pH) to study acidic mucins and combined Alcian blue - PAS to study the mucin character. 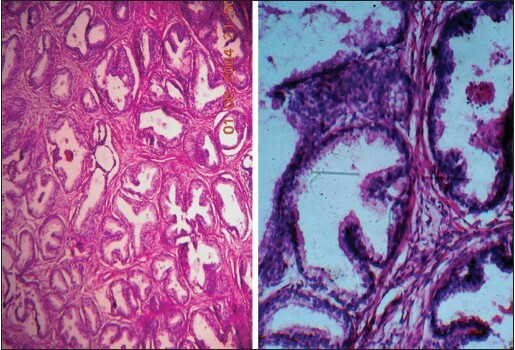 Results: Benign hyperplasia of prostate showed positivity for neutral mucins (98.57%) but not for acidic mucins, whereas prostatic carcinomas showed positivity for acidic mucins (46.66%) in addition to the positivity for neutral mucins (56.66%). All the cases of low grade prostatic carcinomas showed positivity for acidic mucins but none of the high grade carcinomas showed positivity for the same. 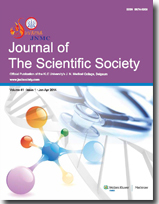 Conclusion: Positivity for acidic mucins with Alcian Blue (2.5 pH) technique can be used to differentiate well differentiated adenocarcinomas of prostate from benign hyperplasia especially in those cases where prostatic lesion is a questionable malignancy either because it is so well differentiated histologically or have altered architecture so as to make it cytologically un diagnosable (P = 0.001). 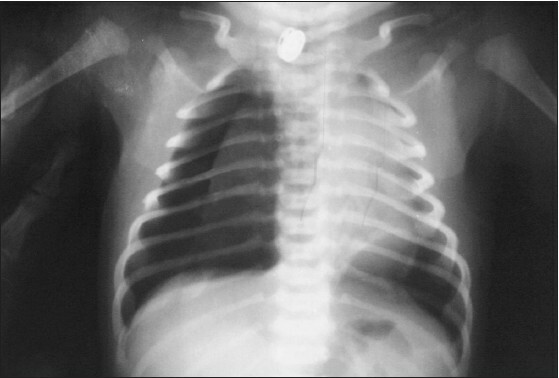 We present the case report of a 23 day newborn baby who presented with congestive heart failure. On two-dimensional echocardiography, it was diagnosed to have severe (critical) aortic valve stenosis with severe left ventricle (LV) dysfunction with dilated left atrium and left ventricle. Emergency percutaneous balloon aortic valvotomy was performed. Post-procedure the child showed immediate relief of aortic stenosis. Improvement in the left ventricular ejection fraction was also noted. 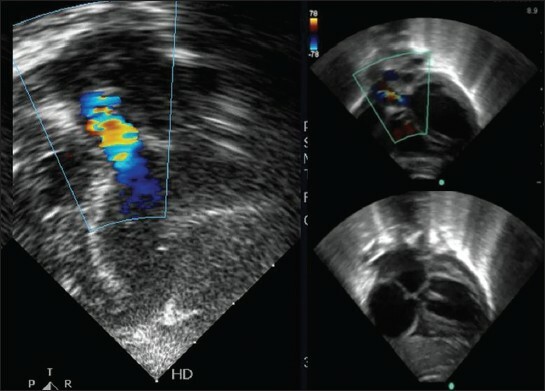 Immediate and short term follow-up shows improvement in the clinical and Doppler echocardiography findings. 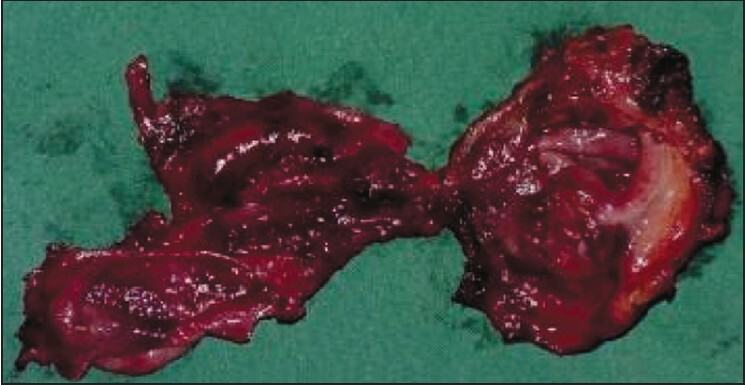 Gall bladder duplication is an unusual biliary anomaly with a reported incidence of 1:4000 in the autopsy studies of humans. Lack of awareness, non-specific symptoms and signs and inadequacy of imaging methods are possible reasons for the reported problem of overlooking of the additional gall bladders before and during the surgery. We present a 22-year-old male who presented to us with a history of acute cholecystitis 3 months back with ultrasonography documented cholelithiasis. Laparoscopic cholecystectomy, which was carried out as an elective procedure, revealed a double gall bladder. An accurate, preferably pre-operative diagnosis, identification and removal of all gall bladders during the laparoscopy are mandatory to prevent inadvertent damage to the biliary ductal system, possible overlooking of the second gall bladder and hence post-operative cholecystitis. 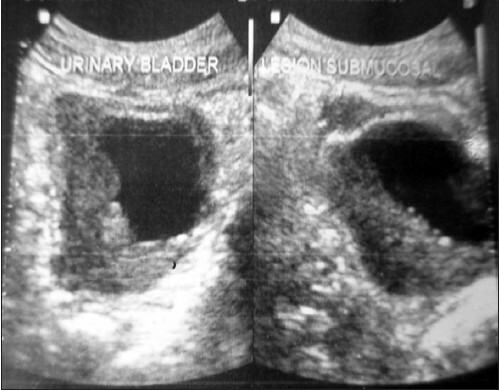 Inflammatory pseudotumors of the bladder are rare in children. We report here the case of an 11-year-old child who presented with lower urinary tract symptoms. Ultrasonography and computed tomography imaging of abdomen showed an intravesical mass/thickening arising from the right lateral wall. 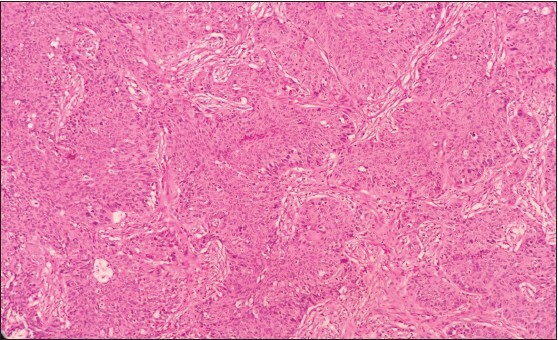 Biopsy of the lesion revealed a lesion that showed uniform elongated spindle cells within a background of myxoid stroma. The cells were loosely packed from a smooth muscle lesion, which had a densely packed cellular stroma. The child improved with a course of antibiotics and a repeat imaging showed disappearance of the lesion. Undisplaced talus neck fractures are uncommon and difficult to diagnose. We present a case of an 18-year-old female came with the complaints of pain and swelling in the foot following a fall from a bicycle 1½ months back. For the above complaints, she had consulted local doctors who had done X-rays of the foot and no diagnosis was made. She was treated conservatively with medications and compression bandage for swelling and the patient was allowed to walk. On presenting to us, X-ray of the foot was done and minimally displaced talus neck fracture was suspected. Magnetic resonance imaging of the foot was done and the diagnosis was confirmed. Patient was operated with percutaneous screw fixation following which below knee cast was given for 6 weeks followed by partial weight bearing. Patient returned to complete weight bearing and previous activity level without pain at the end of 3 months. Although emphysematous pyelonephritis is recognized from more than hundred years, the etiology is still controversial. Glucose fermentation is the proposed possible mechanism for gas fermentation. The extension of emphysematous pyelonephritis into portal vein and stomach is a rare condition. 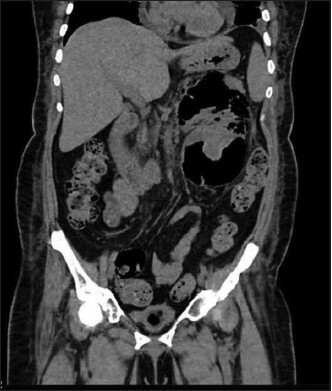 We present a 52-year-old woman with uncontrolled diabetes who was admitted with sepsis and left flank pain. She was investigated, and results revealed gas in the left renal system with extension into portal vein and stomach. She was resuscitated and managed with percutaneous drainage, DJ stenting, and broad spectrum antibiotics, she did not improve and hence nephrectomy was done. Prompt diagnosis, early and aggressive treatment is crucial because of high mortality. Squamous cell carcinoma occurring in a background of chronic suppurative otitis media (CSOM) is a rare complication. It runs an aggressive course. Hence early identification is significant to prevent disease progression and to improve the survival rate. Subjecting granulation tissue from middle ear for histopathologic examination is of importance to rule out associated malignant change.